My wife and i have together two iPhones with ATT. We chose the lowest minutes (750) and for each phone 200 text messages. We have this contract since 2 years and paid around $140 a month (we get a 18% discount). Last week we decided to take my mother in law cell phone on our contract. ATT is offering additional line for only $9.95 which is much less than she is paying now. My wife went to the ATT store explained them that she wants a simple phone with big buttons and of course no texting and no data plan for the new phone because her mother is over 70 and does only use the phone for calls. She told me that the sales guy at ATT was very nice. She told him as well that she would like to change our texting because the last few months we have been over and paid for each extra text message 10 cents. Which did total to $20 a month in average. Btw can anybody explain me why we need to pay twice when I send a message to my wife? Why does it count as sent and received? He told her to pay $30 more to get unlimited family texting, she asked what it means and he said that for this extra everybody can send unlimited text. This week I got the bill and almost a heart attack. The bill was almost $300. I looked through and figured out that a)they sold my mother in law a data plan which is $30 a month, b)we pay for her 200 text messages and c) The family texting is only for sending text message to family member on same contract. But my wife thought it is unlimited anywhere and started (like me) to text much more to friends. As a result, we were 1,000 text messages over, which is $100 extra. We felt screwed from the ATT guy, I am pretty sure he knew what he did. We are going to try to get our money back but I have not much hope. 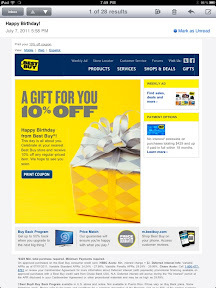 This week was my birthday and I got a nice email from BestBuy. 10% off my next purchase. I printed the coupon and went to the store. It was a perfect timing I just got for birthday the xbox 360 kinect and needed a second controller and some games. The coupon is not really clear with what is included or not. But for sure not computers (like iPads) but it says game controllers and DVDs are included. First thing, I asked a rep in the game department if the coupon is valid for games and controllers. He said yes as long it is not the xbox itself or reduced priced games. Great. He even mentioned if the cashier makes problems I should let him come to the cash register. I took 3 games and controller and went to the register. They guy scanned everything (I gave him as well my coupon) and I paid. When I looked at the receipt I saw that nothing got discounted. He apologized and said that games and controllers are not included. And that he can't do anything. So I asked that the other guy comes. He came and apologized as well and said that they can't do anything the register will not take any discounts with this coupon for the chosen items. I asked for the manager but same answer. I cancelled my transaction and guess what, the money was instantly out of my account but it takes up to two weeks till the money is back in my account. Is this the new trick from BestBuy to make money? Working two weeks with your customer money can give a lot of interests. Last week was the latest NY Times update on the iPad and I am a little bit irritated. I had no crash since then. Are they finally able to build a stable app? it is loading much faster, updating much faster the articles and it does not crash at all. Now they only need to get the problems with the webcasts working and then it is finally a good app. I have for my blog now a Facebook fan page. But I need to get at least 25 likes to get a real URL. Please like my fan page http://www.facebook.com/pages/New-Kid-on-the-Blog/124605060959606. I hope to get feedback an discussions going on the page. Things I should write or should not write and so on. First Palm, then RIM and then Facebook? Lion install -easy, using Lion -horrible. Facebook or google? What about foogle? Google music or Amazon cloud player? Final Cut Pro X - What is behind the story?